Paul Graham Raven has the first of his three-part series on Nordic larp up on the art/technology site Rhizome, and he gets bonus points for working in the word “Morcockian.” When we spoke, he asked great questions and really seemed to have done his theoretical homework. The first piece lays out what Nordic larp is or might be. Over on the Plan B Rollespil blog, lauded indie designer Jason Morningstar gives slammin’ advice on how to edit scenes in tabletop games. The secret is to find what improv junkies call “the button of the scene” and then to push it. Mornginstar tells you how. Riffing off the improv theme, I just discovered drLARP‘s advice on what larpers can learn from improvers, including the rule of yes, active choices, and being genuine. A nice write-up. Happy birthday to my blog! I’ve been blogging once a week about gaming for a year or so now. The Freakonomics podcast — one of my favorite things to perform chores to — has two recent larp-salient episodes. The first crosses the interactive theatrical production Sleep No More with the Stanford prison experiment. It’s criminal that larp — and particularly stuff like the recent Danish prison larp Kapo — doesn’t rate a mention, though some savvy listener drops Nordic larp and jeepform into a comment. I recently listened to an older, related episode that looked at humans and the herd mentality, covering stuff like how mimes — THAT’S RIGHT, MIMES! — helped stop traffic fatality in Bogota. I think this speaks to safety concerns in larp in a sideways manner; organizers might consider which type of behavior they’re normalizing. Finnish designer Massi Hannula visited the Danish convention Forum, and explains what went down. Thomas Be wrote up a description of the alternate reality game (ARG) The Spiral, associated with a European TV mystery serial of the same name. Nice clear rendering, and the game sounds like a lot of fun. There’s a nice write-up of HG Wells’ influence on war gaming over on Kotaku. Larp Chick has a pretty sweet list of advice for people thinking of running weekend plot at a boffer larp. Over at the Nordnost podcast, we benefit from cultural imperialism! Gamers from Brazil, South Korea, Germany, Italy and more talk to us…in ENGLISH…about their locale scenes. A guy named Jon Peterson has written a new book on the early history of RPGs called Playing at the World . Wired.com (and Fantasy Freaks and Gaming Geeks) author Ethan Gilsdorf calls it a “must read” for the serious enthusiast. 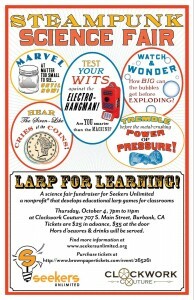 Seekers Unlimited still has its fundraiser coming up next week in CA (see image below). This entry was posted in Features, Larp and tagged drLARP, Ethan Gilsdorf, Forum, Freakonomics, HG Wells, Jason Morningstar, Kapo, Kotaku, Larp Chick, Massi Hannula, nordic larp, Nordnost, Paul Graham Raven, Plan B Rollespil, Playing at the World, Rhizome, Seekers Unlimited, Sleep No More, Stanford Prison Experiment, The Spiral, Thomas Be, Tough Gig by Lizzie Stark. Bookmark the permalink.